Necrotizing fasciitis, light micrograph of a section of infected dermis. Necrotising fasciitis, commonly known as flesh-eating disease, is an uncommon but life-threatening infection. It is defined as necrotising infection involving any layer of the deep soft tissue compartment (dermis, subcutaneous tissue, fascia or muscle). The essential treatment is early and aggressive debridement (removal of dead, damaged, or infected tissue) of the involved tissue. Resuscitation antibiotics (combining common antibiotics with additional compounds) and medical care are also important. 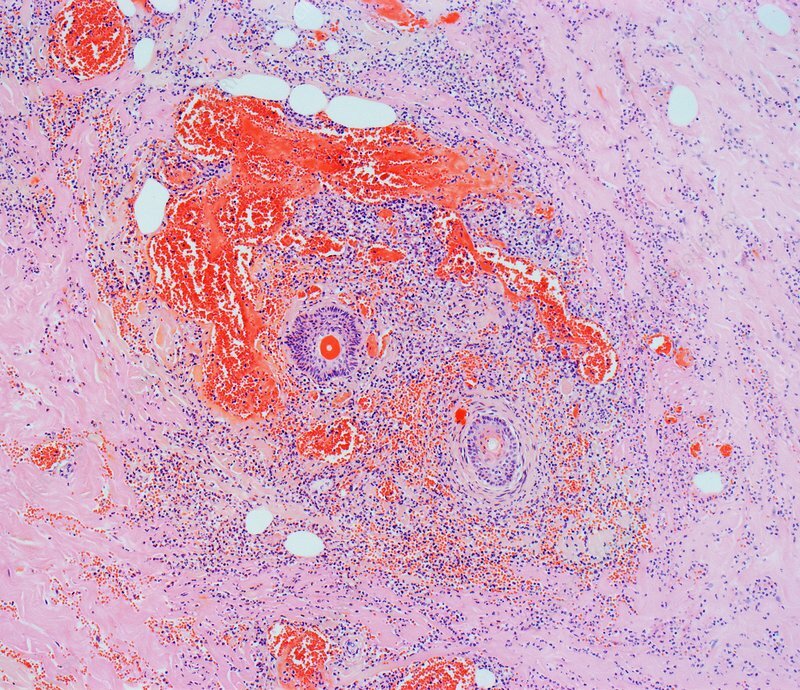 Histology shows an extensive acute inflammatory reaction with associated intravascular thrombosis and necrosis. Magnification: x 150 when printed at 10 centimetres across. Human tissue.